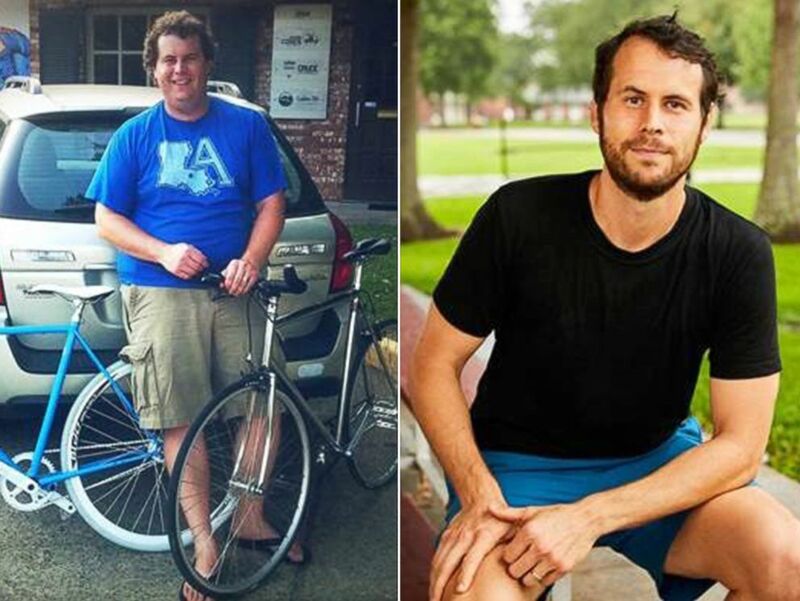 A private group gives encouragement and community to men trying to lose weight. 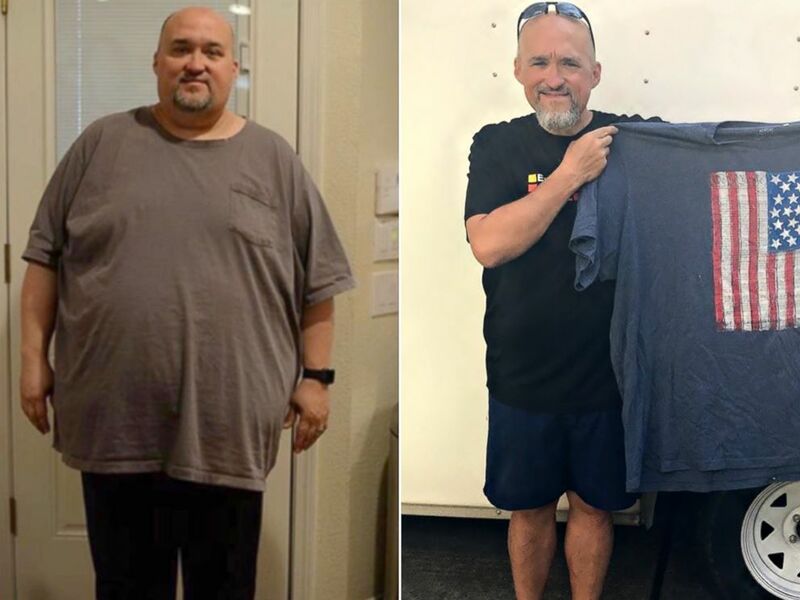 A private Facebook group has helped its members lose a collective 4,000 pounds by offering tips, encouragement and community for men hoping to shed excess weight when they don't know where to start. Joshua LaJaunie, a self-described country boy from Louisiana, said he founded the "Missing Chins Run Club," on Facebook to give "beer-drinking, back-slapping men an avenue to health and happiness." (Joshua LaJaunie) Joshua LaJaunie, the founder of the Missing Chins Run Club, is pictured before and after his more than 200-pound weight loss. "Compared to where I was, I'm an Olympian," LaJaunie told ABC News. The private group, which now has more than 80 members who have lost over 4,000 pounds collectively, gives men a platform to share their weight loss journeys and cheer each other on. "I didn’t realize it was going to be so big in the beginning but I really had aspirations that we would be able to reach out," Lajaunie said today on "Good Morning America." "I had been inspired throughout my journey and I felt it important to pay it forward to the universe and to do that for other guys." He added, "To see what has come of it is just amazing." 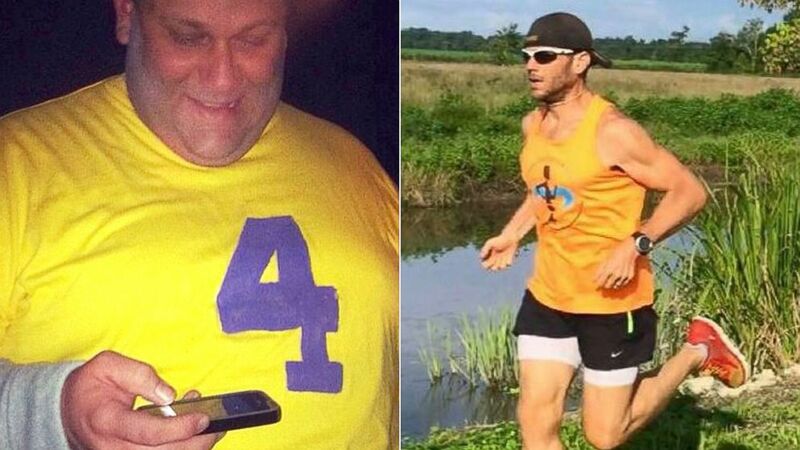 Jason Cohen, 33, of Lafayette, Louisiana, lost 125 pounds through the support he found in the Facebook group. (Jason Cohen) Jason Cohen, 33, is pictured before and after the weight loss he achieved as a member of the "Missing Chins Run Club." "Whenever I don’t feel like getting up in the morning or running, I see somebody else post they ran four miles, I’ve to go run six," Cohen said. "If they’ve run six, I’ve got to run eight." "It keeps me motivated to get up every day, lace up my shoes and just get out there." Marcus Cook, 45, of Houston, lost 280 pounds and completed an Ironman, a long-distance triathlon. (Marcus Cook) Marcus Cook is pictured before and after the weight loss he achieved as a member of the "Missing Chins Run Club." "Two years ago, I was 500 pounds," Cook said. "I started walking 20 minutes a day and six months ago, I did a full Ironman." 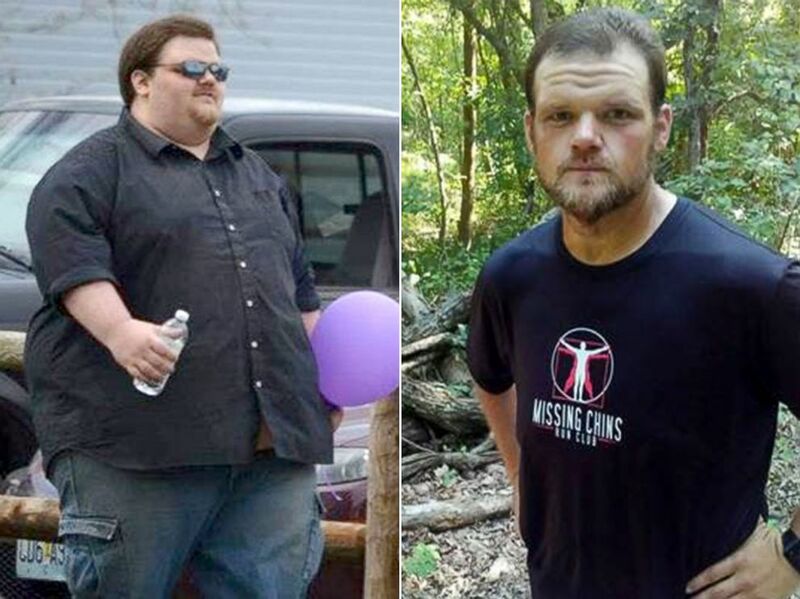 Justin Lacy, of Missouri, lost close to 300 pounds. (Justin Lacy ) Justin Lacy is pictured before and after the weight loss he achieved as a member of the "Missing Chins Run Club." He said he was inspired to lose weight after his mom suffered a stroke, and now he is the inspiration for his family. "They’re so proud of me and they’re eating plant-based too and getting healthy too and losing weight and getting off medications," Lacy said. "It’s a beautiful thing." 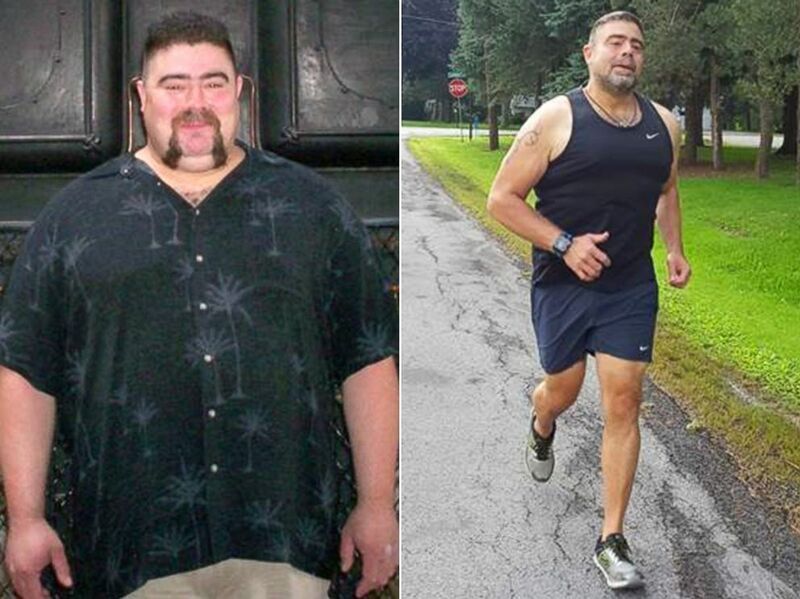 Tim Kaufman, 44, of Alden, New York, lost nearly 200 pounds through the "Missing Chins Run Club." (Tim Kaufman) Tim Kaufman is pictured before and after the weight loss he achieved as a member of the "Missing Chins Run Club." "It just keeps everybody motivated in so many different ways," Kaufman said. "I think that I can speak for all of us: it’s not just about what we’ve lost, it’s what we’ve gained." 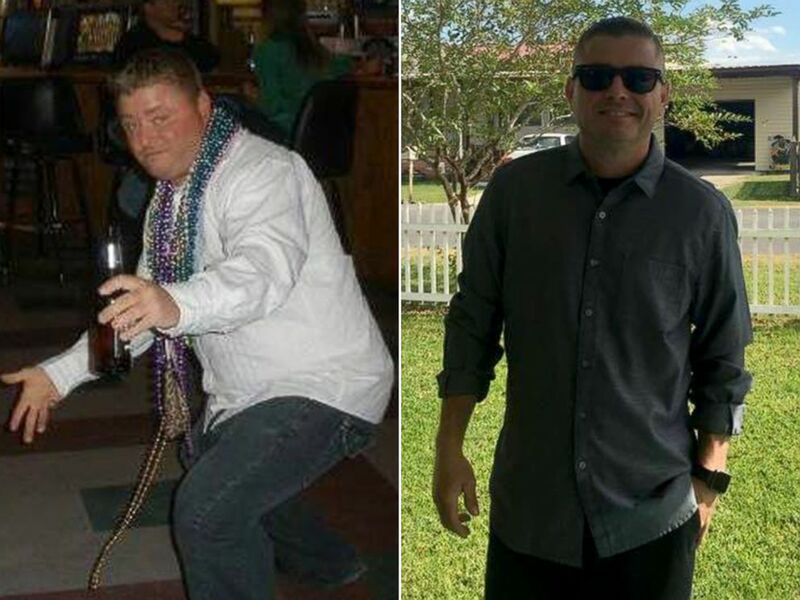 Josh Turner, 39, of Thibodaux, Louisiana, said the nearly 100 pounds he lost is more than just a number. (Josh Turner) Josh Turner is pictured before and after the weight loss he achieved as a member of the "Missing Chins Run Club." "It was never really about the weight, it was more about getting my Type 1 diabetes under control," he said. "That’s all it is." "If you're looking to lose weight and you're trying to get started, it would really serve you well to understand ... the subject of 'calorie density,'" LaJaunie told ABC News of his top tip for weight loss. LaJaunie described calorie density as understanding that the same volume of two different types of food can have a vastly different number of calories. He cited the example of eating a bowl full of green leafy vegetables versus filling the same sized bowl with fried chicken, saying the latter may contain "about three or four times the amount of calories, in that same volume of food." "Understand how to still eat big meals, and enjoy yourself and be full, but at the same time you won't be overconsuming, and your body won’t need to store excess calories or body fat," LaJaunie said. LaJaunie's second tip is to just go outside and get moving, even if it is just walking at first. "There is no need to join a gym," LaJaunie said. "You can just go outside, and lace up, and move yourself with your legs. You don’t have to run but ... move your body." "Do it with some purpose and do it on purpose," he added. "What we’re doing, more so than anything, is building muscle memory, and habits." Finally, LaJaunie emphasized the importance of support from others when you first embark on your weight loss journey. "Go public with your goals, try to find a group to get with on social media, really build some community around these new habits," LaJaunie said. "Think about how important your community is to your identity," he added, saying social media is a great place to find others who can hold you accountable and encourage you to reach or maintain your health goals.